The 2019 Evaluation Roundtable convening explored how evaluation leaders—working within or with foundations—can manage change not just defensively, but proactively and productively. Evaluators who work with foundations constantly are trying to deliver value amidst change, through internal transitions (a new CEO, a strategy refresh, an update in values), or external transitions (developments in our discipline, evolving sector standards, or shifts in political dynamics). How can we prepare for and manage transitions while advancing the quality, rigor, and value of evaluative thinking and data? 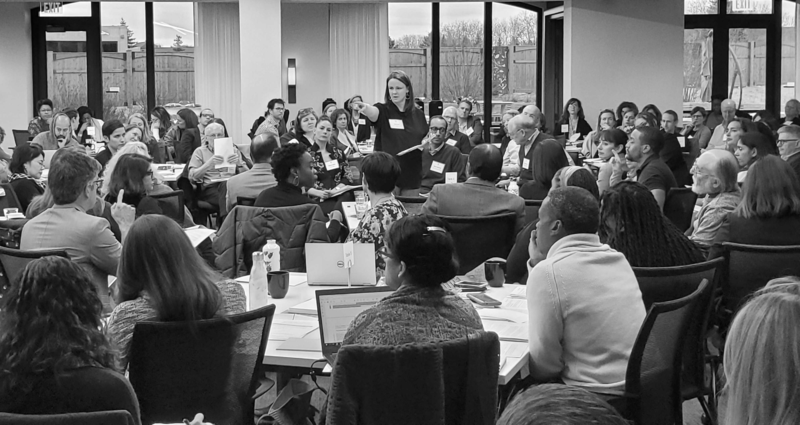 The 2019 three-day convening explored how we as evaluation leaders—working within or with foundations—can manage change not just defensively, but proactively and transformatively. It focused on the forces that shape evaluation in philanthropy and what they mean for our work. These forces have multiple places of origin—the philanthropic sector, our own organizations, and our broader context. Our teaching case came from The Colorado Health Foundation, an organization that has been experiencing whole-scale transition organizationally, while grappling with changing demands in our profession and sector, including equity, systems and complexity, and changing standards of evidence. Our guest speaker, Thomas Schwandt, gave a presentation on Rethinking the Moral Compass for Evaluation. He challenged the classic, modernist approach to evaluation as less relevant for today’s post-normal times. Instead, he encouraged us to think about evaluation as a risk-laden effort at wayfinding; a reflective practice requiring competent citizens, not just competent professionals; learning from other voices, not speaking for others; and as advocating for examining the ethics of interventions.